In this article, you will learn the basics of Enterprise Architecture. In simple language, any laid out principle to design, develop, implement or/ and consume the Service or a product or a combination of two is called Reference Architecture. It’s been a while since I completed my TOGAF education and trust me it was a completely different "viewpoint" to look at the things in general. Basically, Enterprise Architecture is a core value system, which is native to any small, medium or large business. This system becomes a container to have all the following. Thus, I am going to write a series of articles on EA, explaining the topic in an easy language and making it easier to understand the concept. The first few posts will be about understanding the basic concepts and vocabulary. Today's post is about reference architecture. In simple language, any laid out principle to design, develop, implement or/ and consume the Service or a product or a combination of two is called Reference Architecture. For example, to prepare the tea, a common laid out principle is that you at least need one cup of hot water and a tea bag. 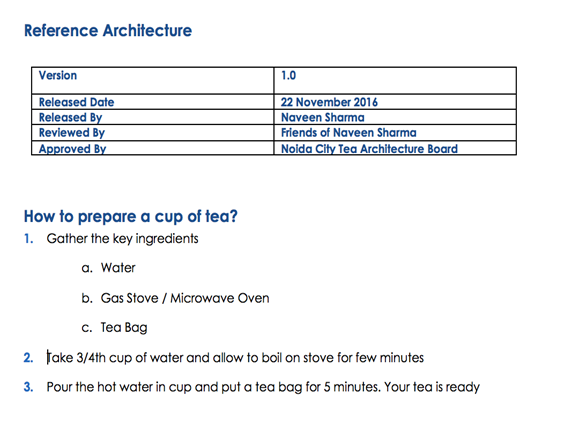 Hence, if we write down this simple principle in a document and put it on a shared repository, which everyone can access and read, this will become the Reference Architecture of preparing a cup of tea. Reference Architectures keep on evolving. 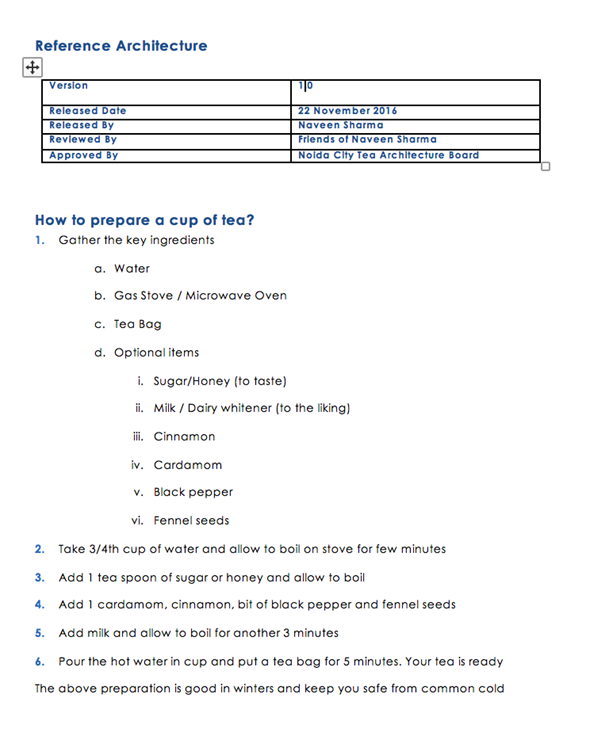 In this example, a basic tea preparation activity is listed and documented but there can be more customized Reference Architectures, where tea can be prepared with adding other components, which is far different from the tea as a product, which was prepared by using the architecture mentioned above. Look at the second Reference Architecture of the tea, which we generally drink as compared to the earlier one. Compare them both and find the difference. This architecture is again written as version 1.0 because this is a modified architecture but first in the series of a modified product. Hence it stays as the first released version in its series. Normal version control system applies to all the documents, which are created as Reference Architecture. They all are kept in the respective folders for an easy and quick reference. These documents are called artifacts. There are different types of artifacts, which can be stored in the repository and most common are given below. Text document (as mentioned above). Matrix (Spreadsheet, where we must show the relationships or the categories). Pictorial representation (A diagram explaining the architecture visually, I consider this to be the more powerful when it comes to explaining the working of an architecture). To summarize again, we have learned three basic things about Reference Architectures, which are given below. It is a laid out basic principle about any Service, product or both. It can be customized as per your need and new architecture can be created for the reference. I will make my next post about the artifacts.